In this post, we will discuss how you can setup minimum required time for delivery of an order in Order Delivery Date Pro for WooCommerce plugin. This feature will work with Delivery Date as well as Delivery Time. If you have an online chicken shop where you provide fresh chicken. And you require 24 hours for preparing the delivery of fresh chicken. For that, you will want next 24 hours to be disabled from the current time for the customers to place the order. This post will be explaining how this can be achieved using the plugin. 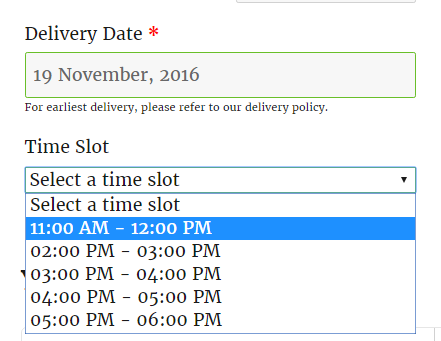 You can find the setting to set Minimum Delivery time (in hours) under Order Delivery Date-> General Settings-> Date Settings. If you have online cake shop where you require at least 24 hours to prepare a cake before the delivery of the cake. So you can set 24 hours in Minimum Delivery time (in hours) field. Now, if the customers try to place an order, then they will find the first available date available for delivery after 24 hours from the current WordPress time. 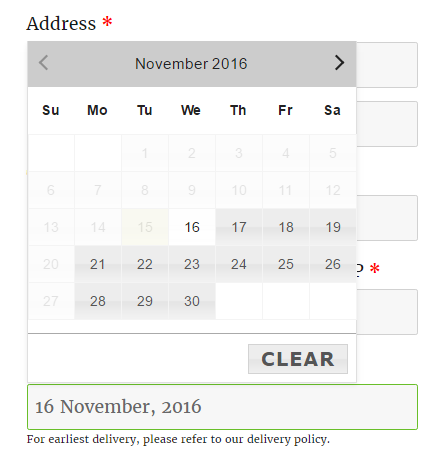 So here, if a customer tries to place an order on 15 November 2016, they will find the first available date on 16 November 2016 and not 15 November 2016 as it will be disabled in the delivery date calendar. 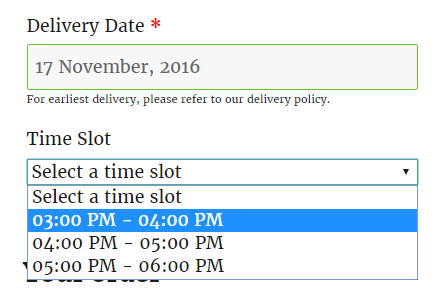 After the date, now we will discuss how the Minimum Delivery Time (in hours) will work with the Time slots. If you have a business where you want that the customers choose Delivery Time also along with the Delivery Date but only after the minimum required time for preparation. For example, if you have grocery shop where you can deliver the orders only after the 4 hours from the time order is placed. So you have to set 4 hours in Minimum Delivery time (in hours). Now if you have set time slots for weekdays with 1 hour time difference. Then the customers will be able to see the time slots only after current time plus the minimum required time set. So here, If the customer will visit your site on 17 November at 10.15 AM and the minimum required time is set to 4 hours, then the first available time slot will be 3.00 PM to 4.00 PM for the current date. All the time slots will be available for deliveries for further dates. And if you have set the minimum required time to 48 hours, then the first available time slot will be 3.00 PM to 4.00 PM for the day after tomorrow. Same as time slot if you have a business where you allow customers to choose the time from the time range you have set. But only after 2 hours from the time the customer visit the website. Then you can set the Minimum Delivery Time (in hours) to 2. Note: Minimum Delivery Time does not work when Same day or Next day delivery is enabled. The configuration setup in Same day & Next day delivery will take precedence & the hours entered in Minimum Delivery Time field will not be considered in such cases. 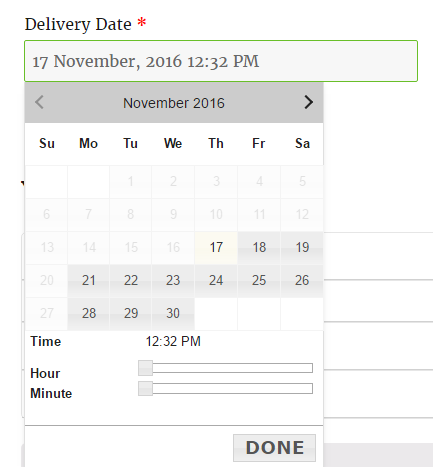 In this post, we saw how you can setup the minimum preparation time for delivery of an order. This feature is useful for all the types of businesses who requires some time for preparation of the deliveries.